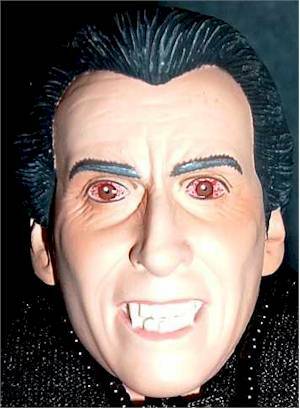 The new Christopher Lee as Dracula figure has been such a popular request with readers, that you get not one but TWO reviews! Tonight, Ron Hatchell covers him here with a great guest review, and I cover him at Movie Poop Shoot with my own review. Take it away, Ron! 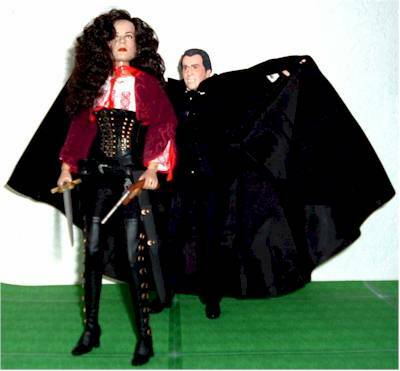 This review is for the Hammer Films version of the 12" Dracula action figure. This one resembles actor Christopher Lee's portrayal of him, although Mr. Lee's name is not mentioned on the box anywhere. Released in late 2004 and Licensed by Hammer Entertainment Ltd. Design: Graham Humphreys. Sculptor: Andrew Teal. The box is similar to the Sideshow boxes in basic structure, with the front flap that opens to reveal the figure and all the accessories fitted firmly into a see-thru plastic mold. The colors are mostly black, with red, silver and white letters. 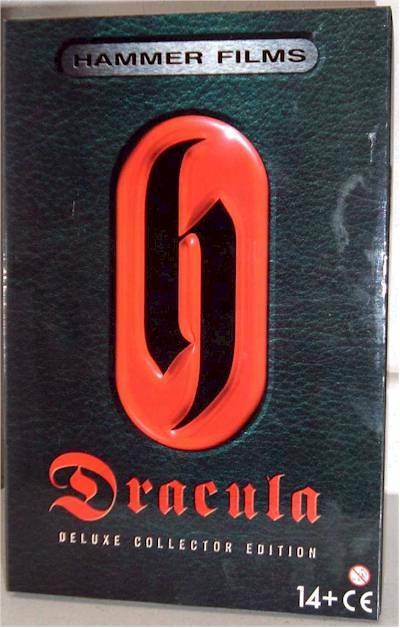 The front of the box says "Hammer Films", a very large "h" in a unique logo design (I'm assuming the "h" is for "Hammer"), the word "Dracula" and "DELUXE COLLECTOR EDITION". Bottom right shows the "14+ CE" symbol and a white round circle with a "0 - 3" (surrounded by a red circle) with a symbol of a child and a red diagonal mark going from one side of the red circle to the other. The two sides and top show the word "Dracula", and the "Hammer Films" with the "h" logo in the middle of the two words. The bottom of the box states, "ADULTS NOTE: CUT PLASTIC RETAINERS WITH SCISSORS AND DISCARD. CAUTION: Minimal assembly required. Parts may have sharp edges or points. Exercise care when opening / assembling. Collector's Model / Not suitable for Children under 14 years." Of course, some collectors might want to save (and not discard) their plastic retainers so they can use them later when needed. The inside flap states: "Hear them...the children of the night. What music they make...", "Count Dracula, the most famous vampire of them all was brought to life by Bram Stoker in his novel about the blood-sucking Transylvanian aristocrat at the end of the nineteenth century. Since then many films have been made featuring the un-dead Count, non (it really says "non" instead of "none") more memorable than those produced by HAMMER FILMS from the 1950's to the 1970's. Dissolved by the sunlight that is fatal to him, entombed in ice or impaled on any number of wooden stakes, DRACULA is dead but won't lie down. Time after time he has returned from the grave to walk the earth and drink the blood of new victims! He is the Prince of Darkness. Product Enterprise Ltd is proud to present HAMMER FILMS CLASSIC DRACULA. This fully articulated collector figure features stunning likeness, real fabric clothes and authentic accessories. So lock the doors, turn up the lights and have those cloves of garlic at the ready. Is that the wind outside? Or is it the sound of something scratching at the window-pane...? " And the "HAMMER h (logo) FILMS" symbol again. There is that piece of white paper that goes between the flap and the see-thru cover for the figure. The back shows a larger picture of the figure in a pose (without the stand), a close-up of his face, a picture of the three accessories and names for them, From the opened flap, you can clearly see the figure and all of the accessories. Pieces of tape (scotch tape-like) secure the top and bottom (two pieces on each). The inside box then slides out the top or bottom opening. There are three ties that attach the plastic mold to the inside cardboard box. One secures the neck and the other two the ankles. Once those are removed the plastic mold can be removed from the display cardboard. There are additional twisties that secure the figure at the waist/left wrist (the left wrist is secured in front of the figure's body), the right wrist, and the display stand. There is also one very thin plastic wrap that surrounds the top of the cape. BE CAREFUL WHEN ATTEMPTING TO REMOVE THE FIGURE FROM THE PLASTIC MOLD AT THIS POINT. THERE IS STILL A PIECE OF THREAD THAT ATTACHES THE BOTTOM OF THE CAPE TO THE PLASTIC MOLD. CAREFULLY CUT THIS TO PREVENT PULLING THE FABRIC OF THE CAPE. The three accessories are in the mold and covered by one plastic piece that is taped to the larger plastic mold to hold all three in place. Like most of these figures, I wish there were some instructions on what to do and avoid when handling these figures, but that seems to be a rarity. So, we rely on reviews. I hope I manage to tell you everything you might want to know (and then some). The design is by Graham Humphreys. The sculptor is Andrew Teal. There is NO mention of Christopher Lee's name, but this looks very much like him. From any angle and any size picture I've seen. So, many kudos to Graham and Andrew. There are many (and I mean "many") lines on his face. Realistic lines on the forehead, above the eyebrows, top of the nose, all around the eyes, and around the mouth. The ears look great. And the hair also has tons of lines and showing enough detail to show how his hair is combed. And the "teeth/fangs" are stunning. Very details. Even to the point of showing some teeth that would concern a dentist. And, of course, two great-looking fangs. Excellent looking and great detail show all over the face. The hands also show many lines across the fingers, and you can clearly see the veins on the top of both of his hands, and his fingernails are easy to distinguish. He has a ring on the left "pinky" finger. The fingers are all separated from each other and are soft enough to bend a "little", which should help keep them breaking off if you accidentally "do" bend them a little. But I don't think they are really made to bend. 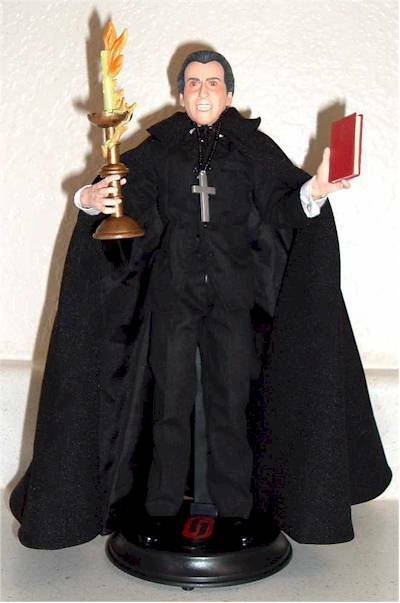 The hands don't seem to be designed to hold any of the accessories, but I'm not sure what he would be doing with Jonathan Harker's diary and a cross anyway. Not sure if he would need a candle either, but you never know. Good flesh tone colour (it "is" an English figure!). The hair has two colours (black with very thin streaks of either gray or silver). Black eyebrows, off-white teeth, and incredible looking detailed eyes, complete with very bloodshot looking red lines surrounding the iris. The lips have a realistic looking pinkish colour. The flesh tone matches that of the hands. The ring is one colour (gold). The head can turn turn side-to-side, but after 1/8", it didn't seem to give as easily, so I just stopped it there, as I am paranoid about breaking things that don't move easily. He cannot look up and down. Fully, realistic range of motion on the shoulders, elbows, waist, hips, top of his legs, and knees. The wrists can do a complete 360 degree turn and move up and down a bit. The ankles also do a 360, but do not move up and down. If they are designed to, the shoes are too rigid to allow this. Although he comes with a stand, I was able to pose him in a variety of positions "without" it, and all joints were tight enough to handle whatever poses I had for him. An "h" (Hammer icon symbol) stand included, which wasn't really needed for most poses. Interesting thing about this stand is that, although the support is like that Sideshow uses now, the actual base itself is hollow and is designed for more uses than it has here. So you might want to be careful when applying pressure while inserting the piece that goes into the slot. There is a place at the bottom side where it looks like a battery goes, and also an area that has a circle of holes (for sound) and a sticker over it that states (Not a Sound Unit). There is also a round piece that looks like it is inserted onto the top front, but with no obvious reason. 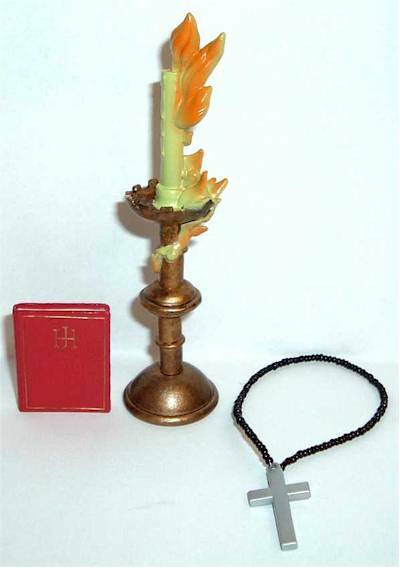 The other three accessories included are a red book with gold printing and border (Harker's Diary), a "flaming candlestick", and a "crucifix". The book looks very realistic, with a lot of detail in the actual book cover and it actually looks like it has a lot of individual pages. Great job on this. The crucifix is silver with a black-bead chain for the neck. Don't think he'll be wearing it, though. And there is a large candle/candle holder that is apparently in flames. The holder is gold with enough black mixed in to give it a more realistic looking appearance. It is over 2.5 inches tall. The candle is somewhat of a light-green, with plenty of was melting and dripping over the side of the candle holder and running almost half-way down the candle. The "flames" start from the wick and extend down almost as far as the wax does. I no longer remember the original movie, so I am not sure of the significance of this "flaming candle", but it looks cool. 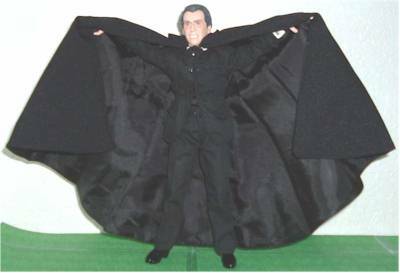 Some might argue that Dracula has no need for the crucifix or Harker's Dairy, but many accessories don't necessarily go with the figure, but are from that movie. I think all Dracula really needs is a coffin and some blood. I would "love" a few coffins for my ever-growing number of 12" vampires I have. His clothes fit snug and do not hinder movement. The shoes are black, and very well sculpted, showing much detail in the design and even many crease lines where you might expect to see them on a real shoe. It looks like a leather dress shoe that extends a bit higher than the ones we normally wear (this also helps explain why the ankles don't move up and down). The pants have a decent quality material and are single-stitched. There is one snap at the top (so his fly is always open) and no pockets. He has a white dress shirt, with sleeves that extend full-length with red cuff-links, three snaps up front, 6 white round buttons (for looks only), and collar. 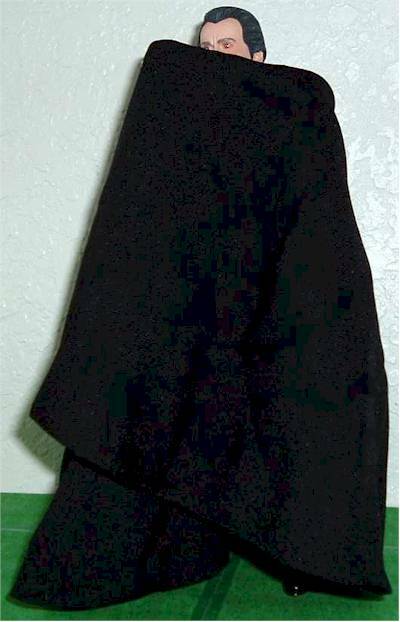 There is a long black piece of nylon-type cloth, about 3.5 inches long and 1.5 inches wide in front of his white shirt (not sure what this is for). His black jacket is also looks pretty good, with two buttons on each sleeve and four in front (buttons are for show only). Two jacket pockets near the bottom and one near his heart (for show only, pockets don't open). Only one snap near the top of his jacket. I was especially impressed with his cape, which is made of two different materials (one on the outside, other in). The inside has more of a silk-looking material to it. If you've watched some of the Hammer Dracula films with Christopher Lee, and like his looks and/or portrayal, you might consider adding him to your collection. Even if you are not familiar with Mr. Lee's portrayal, he still looks evil and scary, with the excellent outfit, incredible sculpture of his face and scary-looking teeth and bloodshot eyes, and, well, "I" like him! There was no mention of a website, so I have no other information on this figure other than what was printed on the box. I have no idea of how many were made, and where else I can get them except for eBay sellers. They have been selling for prices ranging from about $40.00 to $50.00 on eBay ads that ship from the U.S., which is why I waited so long to get one, as I didn't want to pay higher shipping costs from England. Since there seems to be less of these available than most 12" action figures, I think it makes the value go up some and justifies the extra $10.00 you might be paying over a Sideshow figure's price. I would say this is excellent in almost all aspects. Very realistic likeness of the character with very fine details, outstanding articulation (except for the neck), and some cool accessories to give to a G.I. Joe or someone else to use against Dracula. 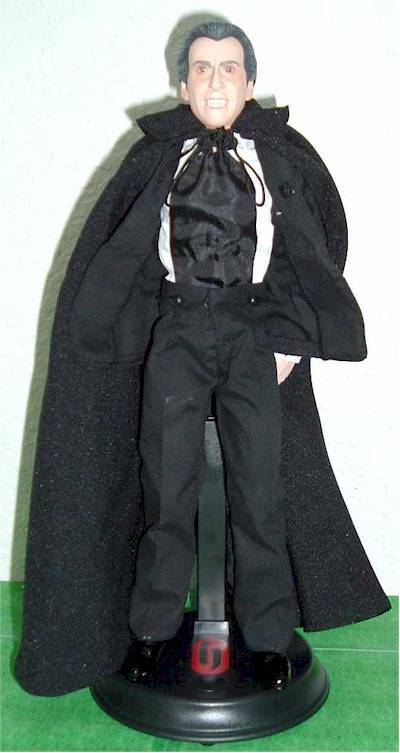 I was wanting this Christopher Lee Dracula before they even made it, and now I have it and am very happy with it. Maybe we'll see a Peter Cushing character figure from them soon? Or their version of the Frankenstein monster or werewolf would also be excellent. I'll be in line waiting for them if they are ever released. I ordered mine through a local U.S. eBay seller. Not sure where else to get these. See Michael's suggestions for these, as he can better lead you this way than I can. Figure from the collection of Ron Hatchell.